How many calls are you booking every week? If you’re like most consultants and coaches, the answer is probably quite a few. After all, getting people on discovery calls is the key to landing more clients, and closing the sale on that call is critical. And if you’re using a sophisticated campaign builder such as ConvertKit, Ontraport or Infusionsoft, you can take your automations to the next level by seamlessly moving subscribers from one funnel to the next based on the actions they take. This powerful system–once it’s up and running–can literally put money in your bank account each and every day, and it’s totally hands-off for you. There are so many great landing page builders now. For instance, LeadPages provides dozens of drag-and-drop templates, making it easy and fast to create opt-in and sales pages. Business owners don’t have to struggle with design and layout–or hire a designer–to build an enticing funnel. If you use opt-in pages in your business, then this is one system that can save you hundreds of hours of time…not to mention frustration. It’s easy to see you can systematize almost every aspect of your business and save time and money in the process. From product funnel building to product creation to team management to bookkeeping, marketing, client care and beyond, nearly every task you or your team does can (and should) be a part of a proven system. Take the time to create your systems now, and in no time at all, you’ll be as productive as those top earners, and you’ll leave others wondering how you manage to get it all done. Are you ready to put the power of systems to work for you? 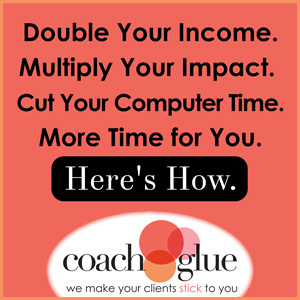 At CoachGlue.com, they’ve created a series of coaching business forms and templates to help you manage every aspect of your business, from finding and onboarding new clients to getting paid to tracking your income and expenses. Their done-for-you coaching forms are fully customizable and will help you create scripts and form letters for yourself and your team to use in every situation. Share them with your support staff, your executive VA, and your sales team, and your business will run much more smoothly and be much more predictable as well. Check out their selection of done-for-you forms. You can get 17 free right here.